The journal Ecology Letters just published findings by Emory biologists that monarch butterflies use medication to cure themselves and their offspring of disease. So what’s in a monarch’s medicine kit? Milkweed – but only a particular species. 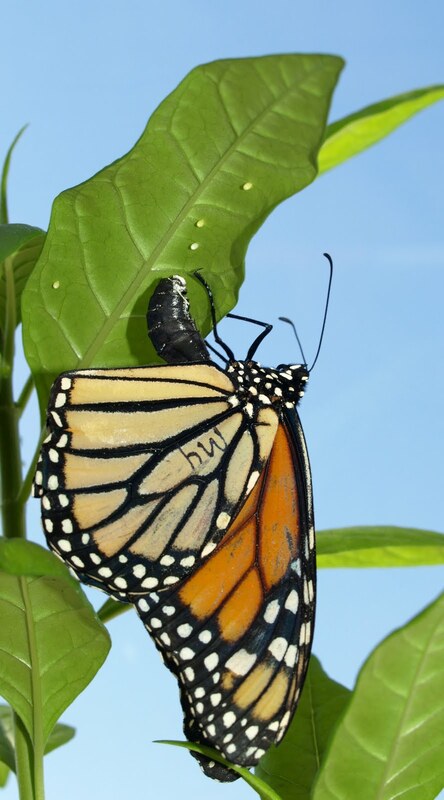 Experiments show that egg-laying monarchs that are infected with a parasite choose plants that have a medicinal benefit for their caterpillars. “We believe that our experiments provide the best evidence to date that animals use medication,” says evolutionary biologist Jaap de Roode, who led the research. Watch the video to learn more, and get a tour of one of the few labs in the world studying monarch butterflies. Photo at left of a monarch laying her eggs by Jaap de Roode. I suspect it will be found to be so for all critters and creatures. Janine Benyus speaks of taking your medicines like a monkey in bioMimicry. Intuitively attracted to the plants which provide them with the vibrational patterns they are low on.